The Warriors came away with their most impressive win of the season on Monday night, earning a 120-90 victory over the visiting San Antonio Spurs. The Warriors came away with their most impressive win of the season on Monday night, earning a 120-90 victory over the visiting San Antonio Spurs. Stephen Curry was absolutely scintillating, scoring a game-high 37 points before sitting out the entirety of the fourth quarter. 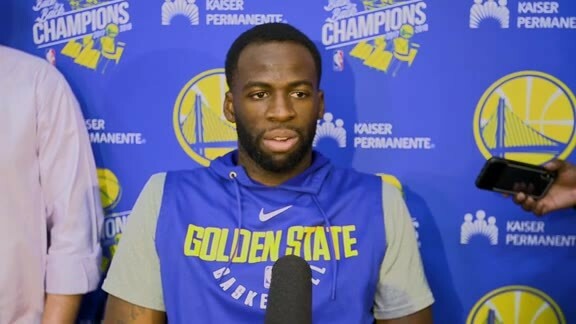 Draymond Green stuffed the stat sheet with 11 points, nine rebounds and six assists, while Shaun Livingston, Brandon Rush and Marreese Speights all scored in double figures off the bench. With the victory, the Warriors improve to 41-4 on the season. 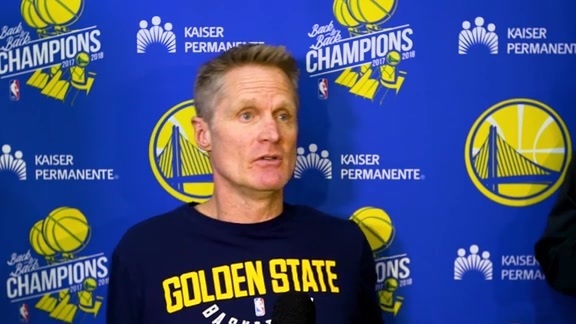 In what was deemed to be perhaps the most anticipated regular season matchup in NBA history, the game didn’t quite follow the script most expected, as the Warriors generated an early lead, and rode that all the way to a blowout victory. Klay Thompson scored Golden State’s first two baskets to open the game, and after Kawhi Leonard tied things up at 4-4 with two free throws, Thompson’s alley-oop to Andrew Bogut on the ensuing possession gave the Warriors the lead for good. Stephen Curry would then get his night rolling, scoring the Dubs’ next three baskets to stake the Warriors to a 14-7 lead with 7:23 remaining in the first quarter. While the Warriors were firing on all cylinders, the Spurs stumbled out of the gates, accumulating an uncharacteristic six turnovers in the first seven minutes of the game. After Curry added his third three-pointer of the opening frame to put the Warriors up 25-16 with 1:31 left to play, San Antonio responded with a 7-2 run over the next 80 seconds before Curry’s finger roll closed out the quarter with the Warriors leading 29-23. Of the Warriors’ 12 made field goals in the first frame, only one was unassisted. David West’s jump shot opened the scoring in the second quarter and pulled the Spurs within four points with just over 11 minutes remaining in the first half, but that’s as close as San Antonio would get for the duration of the game. 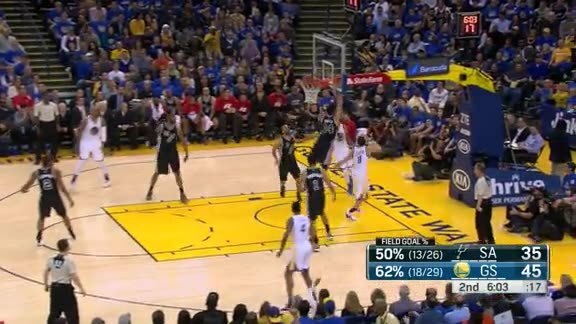 Leandro Barbosa and Shaun Livingston would score on consecutive layups, as the Warriors proceeded to build their lead and eventually run away with the game. A minute later, Livingston would begin a stretch in which he scored seven-straight points for Golden State, pushing their lead to double digits. After LaMarcus Aldridge dunked to pull the Spurs within 10 points with 5:37 left in the half, the Warriors would outscore San Antonio 10-1 over the next three minutes to take a commanding 57-38 lead. The Spurs would then close the quarter on a 9-5 run, sending the game into halftime with the Warriors holding a 62-47 advantage. Golden State’s 62 points matched the most the Spurs had given up in any half this season. Kawhi Leonard’s two free throws trimmed the deficit to 66-54 with 9:35 remaining in the third frame, but Stephen Curry put a halt to the Spurs’ encroachment with one of his several dazzling displays of the evening. 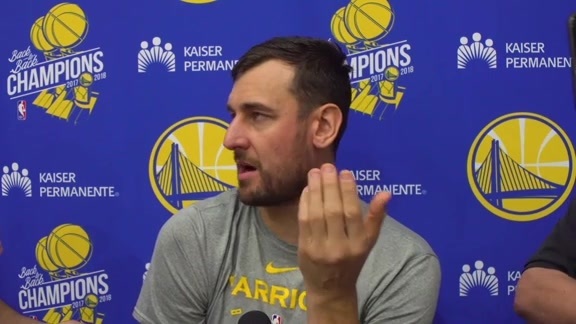 Curry would sink two free throws of his own on the ensuing possession, and then followed that up with a jump shot and two consecutive three-pointers in succession to put the Dubs up 76-56 with 7:55 left in the quarter. San Antonio found themselves trailing by the same deficit three minutes later, before Curry put his final stamp on the game. The reigning MVP would score Golden State’s next five points before sinking his sixth and final three-pointer of the game to put the Warriors up 92-65 with 1:14 remaining in the frame. 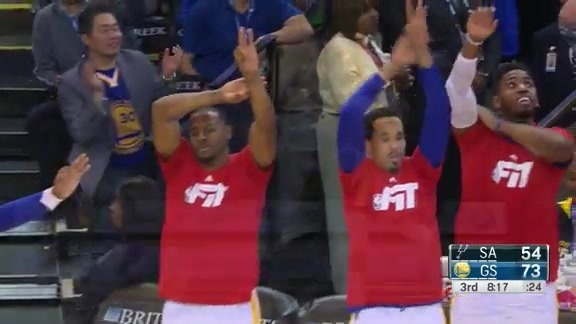 With the game already well in hand, Curry was subbed out, as the Warriors’ bench took over. Marreese Speights would score the next three points before Manu Ginobli’s split free throws sent the game into the fourth and final quarter with the Warriors leading 95-66. A 5-0 San Antonio run would trim the deficit to 98-74 with 6:38 left to play, but the Warriors’ bench made sure to squash any lingering hopes the Spurs had. 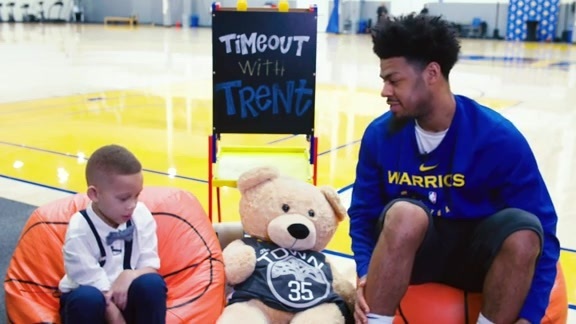 The Dubs’ supporting cast would outscore the Spurs 12-5 over the next three minutes to give the Warriors their largest lead of the game up to that point. Speights would add two three-pointers in the final 75 seconds of action, as the Warriors coasted to the 120-90 victory. Golden State’s 120 points were the most San Antonio had allowed in any game this season. With the win, the Warriors improve to 41-4, matching the best record through 45 games in NBA history. 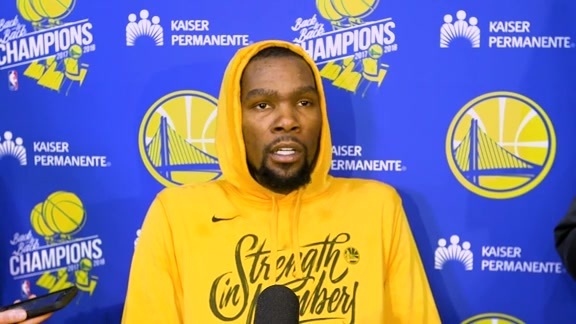 They’ll attempt to ride the momentum of this big win into their next game when they host the Dallas Mavericks at Oracle Arena on Wednesday. 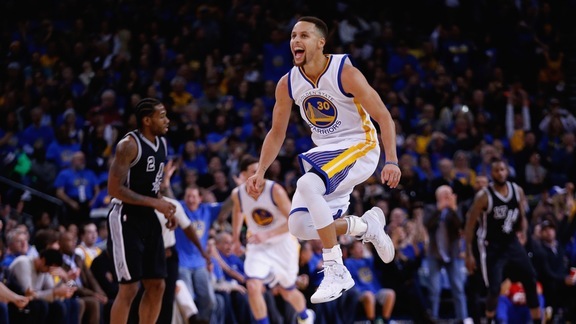 The Warriors beat the San Antonio Spurs 120-90 on Monday night at Oracle Arena. 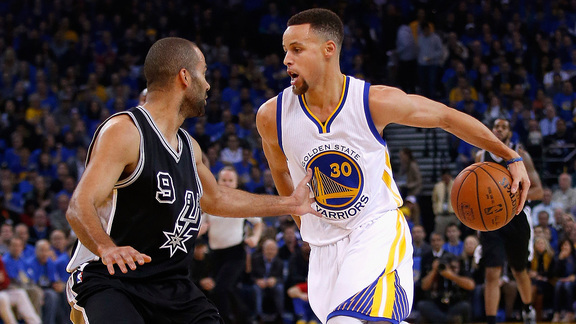 Stephen Curry scores 37 points as the Warriors thump the Spurs 120-90 at ORACLE Arena. Stephen Curry had 37 points in 28 minutes, leading the Dubs to a big win over the Spurs on Monday night. 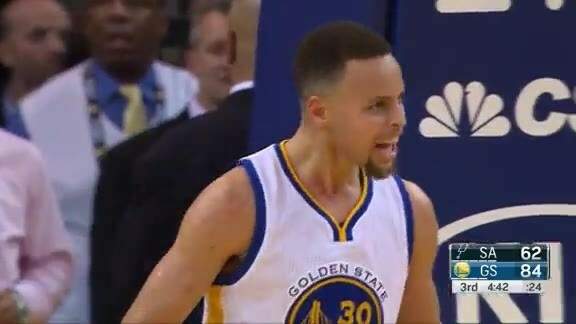 Stephen Curry shows off some emotion after yet another highlight-worthy finish on Monday night vs. San Antonio. 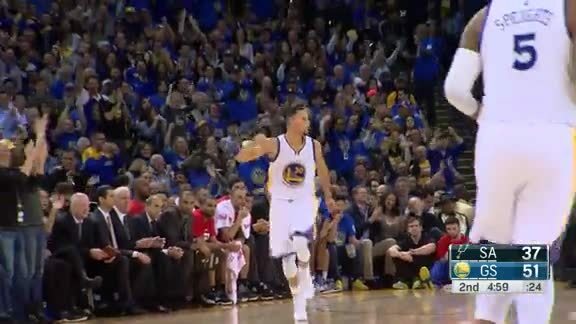 Stephen Curry shows off his ball-handling skills and sinks the floater on Monday night vs. San Antonio. 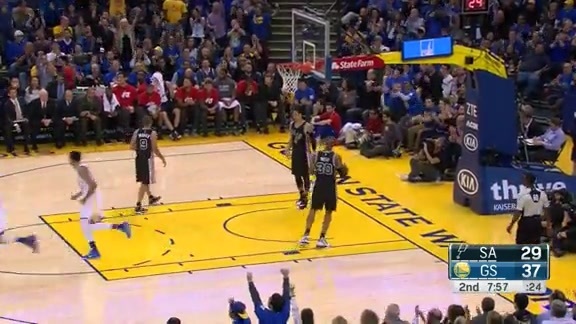 Stephen Curry splashes home a pair of treys on Monday night vs. San Antonio. Stephen Curry lights it up from beyond the arc. 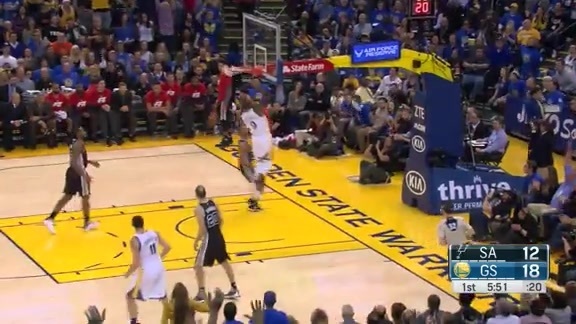 Shaun Livingston takes it all the way down the court for the slam. Shaun Livingston gets back-to-back dunks on Monday night vs. San Antonio. Draymond Green finds a cutting Klay Thompson for the layup. 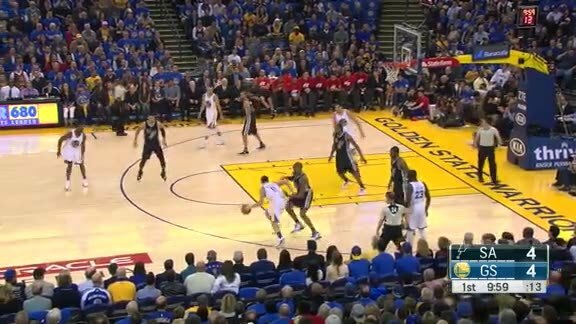 Stephen Curry with roller coaster route to rim on Monday night vs. San Antonio. 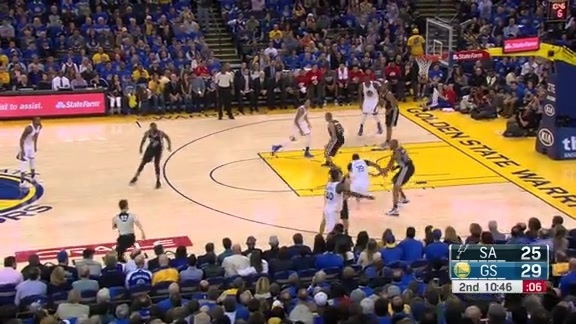 Leandro Barbosa sticks with the play and gets to the hole on Monday night vs. the Spurs. 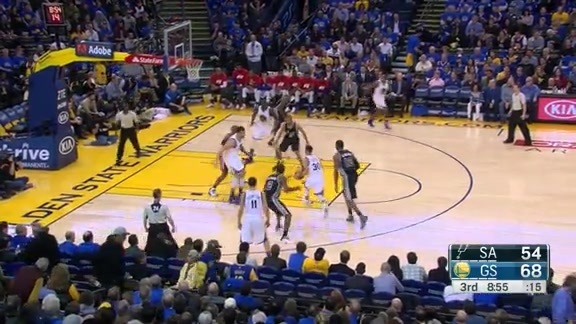 Klay Thompson drives and lobs to Andrew Bogut on Monday night vs. San Antonio. Andre Iguodala finishes the break with the one handed jam on Monday night against the Spurs. Stephen Curry gets the steal and goes behind the back before laying it up.